Our Economy Saver 1-3/4 inch wide Titanium Coated Bi-Metal Quick Release Blade joins our family of long lasting Universal cutters. The introduction of Titanium coated blades has elevated the all-purpose cutting capability of multi-tools and now we've got them for Quick Release multi-tools too. The Q450T Titanium Coated saw blade is a long lasting Universal multi-purpose cutter. 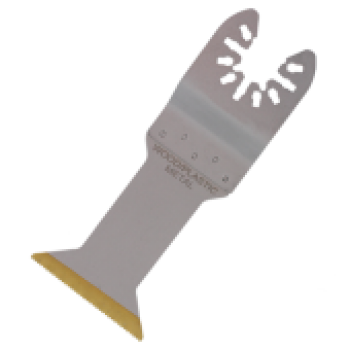 This 1-3/4 inch wide blade is ideal for demolition or precision cutting of nail embedded wood materials. Made with a proprietary blend of high speed steel and alloy steel, coated with titanium.